Living Colour (Vernon Reid, from left, Corey Glover, Doug Wimbish and Will Calhoun) is working on a new album and playing Skokie's Backlot Bash on Saturday. One day in the mid-'90s, while Living Colour's Vernon Reid was taking a break outside Unique Recording Studios in New York, the Notorious B.I.G. pulled up in a gray Mercedes. "I'm looking at him: 'That's Biggie.' Next thing I know, he steps up: 'What's up? Who is you?' " recalls Reid, who'd been playing guitar on singer Madeleine Peyroux's "Dreamland." "It was obvious we had our instruments with us. It's not like the 1930s, or something, like I'm going to pull a Thompson machine gun out of my guitar case." Reid and his fellow musicians established they were fans of the famous rapper, who "just kind of rolled his eyes and went into the studio," as the guitarist recalls. A couple of years later, in 1997, B.I.G. died in a Los Angeles drive-by shooting; this year, Living Colour recorded a hard-rock version of his 1994 anthem "Who Shot Ya," as a pointed gun-violence commentary. The band plans to release the song, including guest stars such as the Roots' Black Thought and rapper Talib Kweli, on a mixtape sometime this year. The idea to cover "Who Shot Ya" was "very organic," says Reid, 57, in a phone interview from his home in Staten Island, N.Y. Corey Glover, the band's founding singer, is a hip-hop enthusiast and has rapped the song at pre-show soundchecks for years. As they prepared to work on their upcoming album "Shade," Reid encouraged his bandmate with the high, gravely voice to rap the lyrics: "It's the only rhyme when you sound legit, because you're not a rapper, you're a singer." In the end, Glover decided to sing. Living Colour's powerful version of "Who Shot Ya" extends its tradition of rock-as-social-commentary. The band formed in 1984, with Reid, a former member of jazzman Ronald Shannon Jackson's groups, as the focal point amid a quartet of unknowns. The band's first hit was 1988's "Cult of Personality," a catchy, big-guitar song that suggests Mussolini, Kennedy, Stalin and Gandhi have something in common. Later, they'd record "Open Letter to a Landlord," ripping those who "treat poor people just like trash," and "Elvis Is Dead," with Little Richard instructing fanatics to "be my guest and let him rest." Around the time he joined Living Colour, Reid also founded the Black Rock Coalition, which supported rock bands struggling to break onto MTV and radio playlists during a long period of broadcast segregation. (He once said, "Black musicians should be able to make music without trying to water it down, without bowing to pressures from the record companies, public, management or producers.") So it's no surprise that the outspoken band would add its voice to #BlackLivesMatter and criticize police violence. "It's just a terrible scourge," Reid says. "Eric Garner was killed within walking distance of my house. I know the spot." Born in London, Reid grew up in Brooklyn and has been a New Yorker most of his life. He was 15 when he picked up guitar, and became a sort of jazz prodigy. His parents supported his music, occasionally telling him to turn down the volume but never labeling what he liked "good or bad." A music career was a different story. "They were somewhat, shall I say, 'dismayed,' " Reid says with a laugh. "For them, this is not a career path. It was a hobby. One of my uncles played the guitar on the weekends — that was pretty much it. "But I wanted to write, draw, paint pictures. Everything I wanted to do in life was artistic and very, very risky," he continues, mentioning childhood favorites like Ray Bradbury's "The Martian Chronicles," "The Twilight Zone" TV series and the "King Kong" and "Dracula" movies. "That was the only thing that really interested me." On the radio, he heard Dionne Warwick, Sly and the Family Stone, Cream, Led Zeppelin, Jimi Hendrix and Santana, and they led him to an exploration of blues and jazz. "Those things just got under my skin," he says. "There was the notion of a weird other thing happening — it's kind of like workaday life (is) walking around, saying goodbye/hello, sitting at the desk, whatever, and underneath all of that there was another internal thing happening with everybody. Music hinted at really turbulent things going on inside of us." 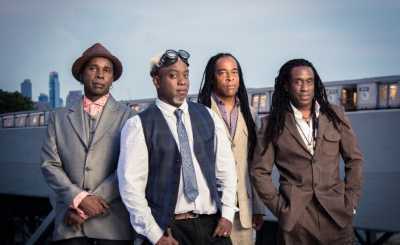 Living Colour, whose lineup includes Reid, Glover, bassist Doug Wimbish and drummer Will Calhoun, is an underrecognized alternative-rock pioneer. Without "Cult of Personality," likeminded bands such as Jane's Addiction, Fishbone and perhaps even Nirvana might not have broken through to MTV and rock radio stations in the '80s and '90s. The band performed on the first touring Lollapalooza in 1991. "Shade," Living Colour's first studio album since 2009, grew out of a tribute performance to the late "Cross Road Blues" singer Robert Johnson, pushing the band into broader blues exploration. Over the last year or two, Reid has promised its imminent release, but it keeps getting delayed as the band tinkers with the song lineup, recently adding a version of Marvin Gaye's "Inner City Blues (Make Me Wanna Holler)." The new planned date will be in early 2017. "With 'Shade,' we're in a pretty good place," Reid says. "I'm really psyched about it. I started out with this whole take on a rethinking of blues and hard rock and metal, and we've pretty much accomplished what we set out to do."